Converting the FFC swords to OD&D. Following up on my post here The First Magic Swords , this will be a look at how to convert them to an OD&D game. Certainly there's an appeal to the idea of using these swords in an "old school" game today, especially if your game is set in Blackmoor. For example, I've been adapting the lower level of Arneson's Blackmoor Dungeon to OD&D, where some of these swords appear in their original form. This conversion method would also work for any new swords created using the old method. Of course, the FFC swords could be used as is, but they are quite different from the standard swords and don't integrate well with other magic weapons that might be floating around in your campaign. Philo's "Weasel" (this last is apparently sword "M" in the FFC). These three swords were converted to BeCMI stats, and while not exactly the same as standard OD&D, these conversions can provide a good guide to follow. I won't bore you with the exact stats for each - you can of course look them up if you like. Instead, lets jump straight to the meat. First, in the FFC there's a clear power differentiation between the Lettered swords and the Colored swords, with the colored swords being the more powerful and more magical. Accordingly, AiB converted each differently into the standard D&D "+" rating. Lettered swords convert to +1 and to +3 versus "Double Value" enemies. Colored swords convert to +2 , and to +3 versus "Double Value" enemies. Double "doubles values" in the FFC were simply ignored, and several similar monsters were converted into a single type like "undead". The AiB conversion also sometimes ignores some of the FFC double value monsters - Balrogs for instance - but I would include them for OD&D. The original FFV swords don't have an intelligence or an ego rating and with only three cases to look at, it is impossible to say for certain how the AiB numbers were arrived at. The FFC swords do have an intelligence increase bonus that is granted to the wielder, and I note that if you add 6 to that bonus you get the Intelligence scores listed in AiB. However, that's not really going to work for us. Where a sword has a double or more Special Value, I treated each case as an additional power. To convert these to OD&D terms is a case by case thing but will usually involve doubling the distance or power of the effect. For Ego, we can look at the existing scores for the FFC and come up with a number that matches the ego scores given for the three swords found in AiB. Now I doubt very much that the method I detail below is what TSR actually did (they probably just rolled a new one) but using this method allows the use of the original numbers found in the FFC, and will give you a consistent conversion rather than a random one. So to determine the swords Ego, add the FFC swords Combat Increase score to the Strength score and divide by 2 (round up). OD&D swords don't normally have spell casting ability, but it fits in just fine, and I keep this feature of the FFC sword in my campaign. If desired, the DM could drop this ability in exchange for an extraordinary power. Magic ability requires a minimum 11 Intelligence. The FFC swords apparently had an alignment, as we know from Greg Svenson. Unfortunetly that information is not in the FFC, so you simply have to roll for it again, following the usual proceedure. 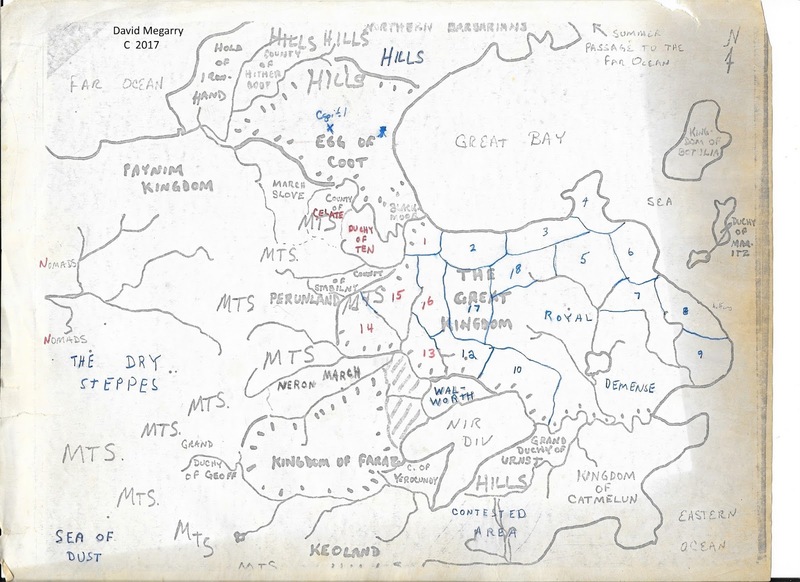 Among Dave Megarry's treasures, he's found another old map. It's a hand drawn map belonging to Arneson, showing another version of the the old Castle & Crusade Societies Great Kingdom map, including notations of the area around the holding of Blackmoor and seeming to focus on provinces of the Great Kingdom. The map is on an old photocopy, made on the old light sensitive paper by the look of it, and contains further notations written on the photocopy in colored ink. Check out Zenopus 'blog Zenopus Archives , and of course, the Secrets of Blackmoor Documentary. Zenopus in particular has done some outstanding work on the Great Kingdom maps, so I asked him to lend his expertise, and I'd encourage readers to enjoy his results. One of the main NPC characters in Arneson's Garbage Pits of Despair is Terrence of Walworth, so it is interested to see Walworth so prominently marked. Walworth, as has been mentioned before, was of course a territory controlled by Gary Gygax. I'd also like to suggest that the "Contested Area" is quite possibly an early reference to what became known as The Wild Coast. 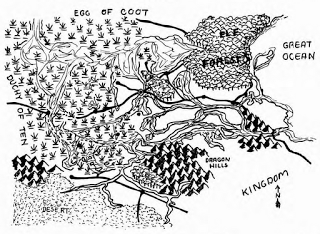 In this map, we are shown the location of the Capitol of the Egg of Coot is marked with an Asterisk. But also of note is just how big the land of the Egg is. Blackmoor is tiny by comparison.